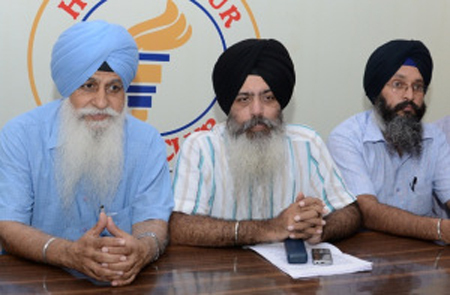 Home/Sikh News/Dal Khalsa raises serious objections to ‘Inviting Modi for Anandpur Sahib celebrations unreasonable’, on June 19 of Khalsa’s birthplace. Dal Khalsa raises serious objections to ‘Inviting Modi for Anandpur Sahib celebrations unreasonable’, on June 19 of Khalsa’s birthplace. Modi Accepts Badal’s Invitation to 350th foundation day of Anandpur Sahib on June 19. Amritsar: Slamming Badals, Dal Khalsa today raised serious objections for inviting the Prime Minister of India Mr Narendra Modi on June 19 to participate in the mega event being celebrated on the occasion of 350 yrs of Khalsa’s birthplace. Party head H S Dhami and spokesperson Kanwarpal Singh in a statement apprehended that this move by Badal government may again enable the RSS to further spread and strengthen their tentacles in Punjab as the saffron brigade did it in 1999. Reminding Badals for inviting then PM Atal Bihari Vajpayee on the tercentenary of the birth of the Khalsa in 1999, they said the then Union government announced 100 crore to Punjab government for celebrations. Ironically, the half portion of the amount was tactfully diverted to RSS for making penetration in Sikh fold under the banner of Rashtriya Sikh Sangat- the illegitimate son of the Sangh Brotherhood. Terming the invitation to PM as uncalled and unreasonable, they said the SAD and SGPC should extend invitation to religious heads of Hindus, Muslims, Christians and other religions instead of Modi. Listing their concerns and objections, they further said Anandpur Sahib was not just a city, it’s birth place of Khalsa. Secondly, the celebrations were being organized by SGPC in collaborations with Akali led government. Thirdly, the Sikhs from world over would take part in it. Calling Hindutva party and its chief Amit Shah and providing them platform to have a field day in Punjab, can further prove disastrous for the community, for which we would oppose. Moreover, few days back, the Jammu police led by its SSP has killed a Sikh protestor and injured others. It’s common knowledge that BJP has full control over Jammu administration and the controversial cop is dear to BJP leadership. They further said the presence of PM and other VVVIP dignitaries would cause inconvenience to Sikh Sangat. “People will be kept at bay and there would be huge restrictions in the name of security”. They alleged that Badals only aim was to make political capital out of it, otherwise Narendra Modi was neither appropriate nor right person to be invited, said they. They said after consulting the like-minded organizations, they may jointly appeal to masses to use their democratic right to oppose Modi’s presence on the historic occasion.